It’s pitch black, i’m sat on a cold solid lava ledge that was formed 27.000 years ago, i’m deep underground below Icod de los Vinos, and there’s not a sound to be heard. After what seems like an eternity, the Cueva del Viento guide, switches his torch back on, the signal for the 20 or so explorers in this volcanic tunnel, to switch their helmet lights back on as well. Suddenly we all re-appear in the eerie half light, just a minutes example of the islolation felt down in the Cave of the Wind. The three levels of volcanic tubes bored through the rock have been closed to the public for the last 15 years but this week the public were at last allowed in again, and I was chomping at the bit to be among the first. Plans were well advanced to re-open before 6 people died from inhaling volcanic gas in water filled galleries in nearby Los Silos in Febrauary 2007. 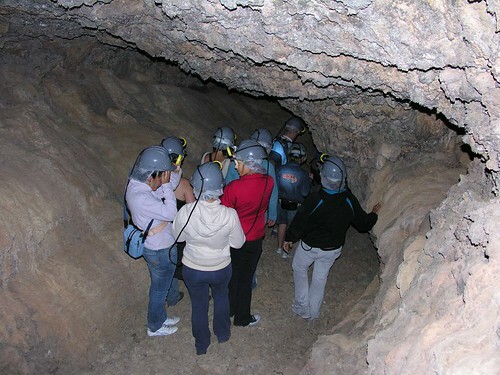 They were part of an unguided party, since then safetyÂ has been tightened around the many caves that are a legacy of Tenerife’s volcanic nature. 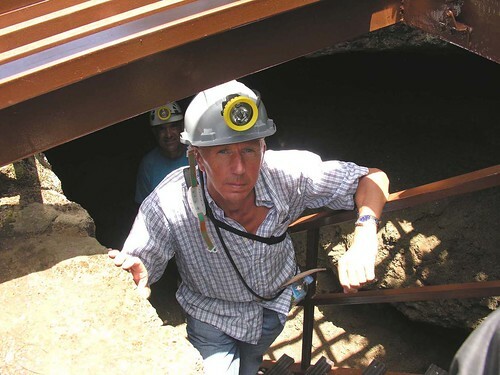 The tubes were produced when Pico Viejo on the east slope of Mount Teide disgorged its red hot lava 27,000 years ago, and other eruptions since have added to theÂ 17 kms of tunnels, one of the biggest collections in the world. 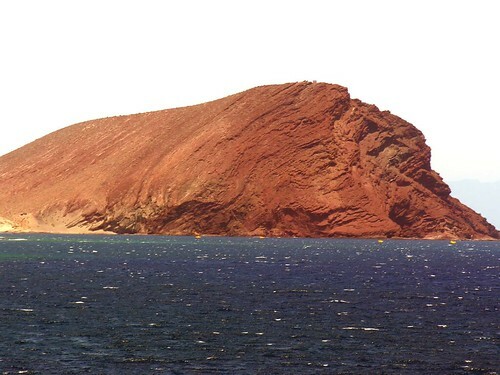 From end to end they drop some 470 metres and reach nearly as far as the sea at Playa San Marcos, and the three layers are inter connected by wells, fissures and at one point a 17 metre deep chasm. My day started with a 460 bus to Icod de Los Vinos, just 3 euros with a Bono ticket, and a one and a half hour journey from Los Cristianos. Once there I met up with explorer, naturalist and writer, Steve Andrews, better known as the green bearded Bard of Ely, a genuine Welsh Druid. A taxi to the village of Cueva Del Viento took just 10 minutes and cost nearly 5 euros, it’s all a steep uphill drive, definately not for walking. The new visitors centre is just opposite a small bar/restaurant and the mid day sun was hot and glorious, be warned, it’s usually a little cooler up north and can be cloudy with some rain. The website advises wearing hiking boots but as I don’t have any I hoped my sturdy trainers would be ok, as it turned out many others in the group had similar foot wear, several were in shorts and even sandals, but that is really risky. Putting on our hard helmets complete with front light connected toÂ a power pack belt, we piled into a mini bus for the 10 minute drive uphill, then we had a steep 30 minute hike up through the pine forest with teasing views of Mount Teide through the foliage andÂ fire blackened trees from lastÂ summers big outbreak. 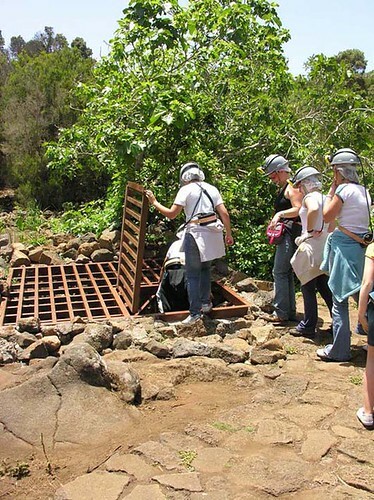 Our entrance to the caves was down below a metal grid, first on carved stone steps and then onto a metal staircase. A delicious chill greeted us, I was in shirt sleeves but it didn’t feel cold, we fanned out in a circle in the first chamber as our guide gave us some relevant facts, using one of several charts posted in the tunnels in Spanish and English. Moving on and down, the floor became very uneven and rocky and we barely had headroom above us. Trying to take photos whilst co-ordinating the helmet light and keeping feet well anchored was a challenge but a welcome one. There are thousands of rare species of insects living in the caves but we only saw a few spiders, but then we only explored a set 1,200 metre stretch. At various points, other small tunnels shot off at tangents above and around us, and our lights could only disturb the dark for a limited distance. 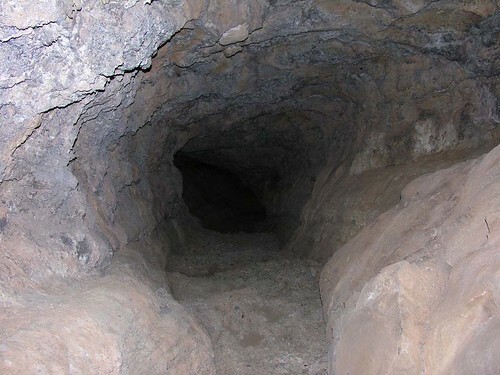 I had always thought of caves as moist, but these tunnels were dry, even though in places, strands of pine roots poked through the rough ceiling. Â At the end of our route, we found a deep chasm with another small upward entry/exit beyond it, sealed with a strong iron grid. The contrast of the bright sun and the meeting of the warm and chilled air gave a strange feel to the surroundings. That marked our turning point, and we retraced our steps, this time in an upward manner. Before long we were back at the stairs, and clambered up to wince at the sunlight and remove the irritating but vital helmets. Walking back to the minibus, we realised we had been down the tunnels for over 90 minutes, although we had barely made a dent on the labyrinth of tubes. This was definatley well worth the wait, the trip was FREE, but will be reviewed at the end of July to maybe set a regular charge. There are 2 trips a day at 10 am and Noon and you need to book first via the website or by calling 922815339. Groups are set for around 20 people and their rating of medium difficulty is about right. I smell like a kipper, that’s not a boast, and i’m not launching my own special fragrance, it’s just an after effect of enjoying the Noche de San Juan on Las Vistas beach, here in Los Cristianos, Tenerife.Â The festival of Saint John is centred on the summer solstice andÂ midsummer day, and across Spain it’s the signal for bonfires on the beaches, through the night. The themes of cleansing and renewal are very strong, the flames of the fire will purify your soul, all you have to do is jump over the fire three times. There are lots of regional variations, many people last night were dropping slips of paper into the fire, these are lists of problems, mistakes and bad habits, all things that the flames will hopefully burn away. As I headed down to the beach, the smell of burning mingled with that of food cooking, and what a pleasant aroma it was. Arriving at the front at 11pm, it was heaving with people, a band was playing live Canarian music, and people of all ages were up and dancing, Canarian potatoes and fish was being served up to anyone who fancied it and the mood was happy and relaxed. 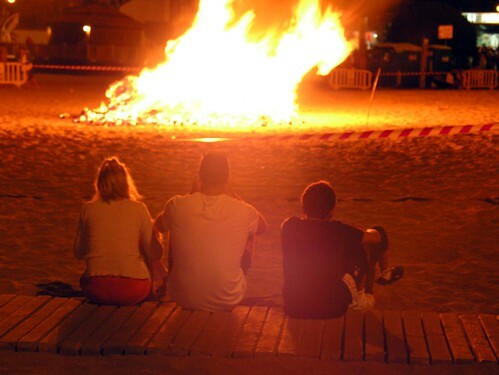 There were 4 or 5 huge bonfires spread out along the beach, and manyÂ smaller ones scattered all around, all down the sand to the shore. It annoys me when people in the UK sneer at Tenerife, it’s not perfect, but it’s great for families. 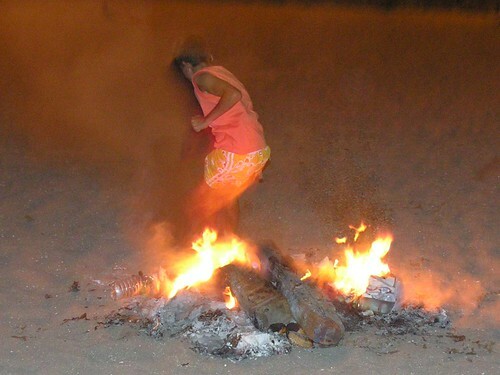 Large groups were gathered around the various bonfires, parents with their children happily running about in the sand, and even a few pet dogs scampered in the sand. Most people were drinking, the ever popular clinking carrier bags kept appearing and several of the beach front bars were open,Â please note UK, flowing alcohol and people having fun, doesn’t have to mean violence. The sea is another great cleanser, many were stripping down to their cozzies and diving into the waves, emerging to dry off round a bonfire. 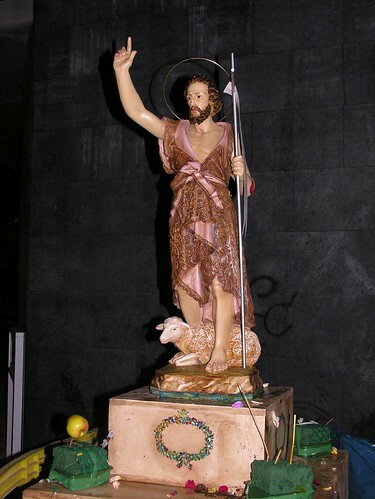 At midnight, a statue of San Juan was carried out into the sea and splashed liberally with water, candles were lit on the beach and flowers placed into the sea, as the dancing and drinking flowed on until dawn. I left at 2am and there were still thousands of people, getting a little sand between their toes, as San Juan looked on. And the day after…I went for my beach swim early this afternoon, and it was like nothing had happened on the beach. The promenade was clean and the bins had all been emptied, on the beach there was no debris from the fires, no bottles or glass, not even a stray chicken bone. They had even put up some temporary seating for a forthcoming volleyball tournament. Top marks to Arona council and their team of cleaners. Not all my trips go to plan, but that’s part of the fun, today was a mixed day but very enjoyable. I got the Granadilla bus for San IsidroÂ to check out the Flight Simulation show mentioned a couple of posts ago. This is the long winded coastal route, which at least alerted me to the piles of sand being dumped for spreading on Las Galletas beach. 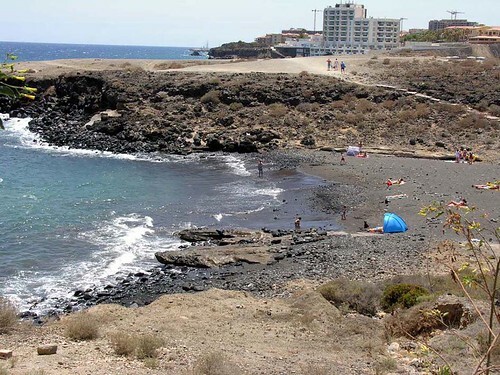 It seems this bounty of sand, scraped off Los Cristianos old beach is being spread far and wide, as it is also topping up the troublesome Playa San Juan beach. Coming into San Isidro from the El Medano road, I noticed a modern and busy looking agricultural market building, that’s one for further investigation. San Isidro itself is a busy town with the main road, Carretera General, climbing steeply on its way to Granadilla , the administrative centre for the region. The Casa Cultura turned out to be an undistinguished building next to the police station and the show was a bit of a geek fest. Several rows of tables were set out with laptops feeding off a bigger computer on the stage, to show the intricate and complicated control panels of various aeroplanes. I had imagined big machines that you could sit inÂ pretending to be in a cockpit, they might as well have all stayed at home and played the programmes. I left pretty quickly and checked the cloakroom on the way out for anoraks, i’m sure it was only the hot weather that made them leave them at home. Time out exploring in Tenerife is never wasted, and a few drinks and some tapas in some little side street bars focussed my mind on an alternative plan. Back on the bus, and a stop off at Los Abrigos seemed a good idea to top up my camera and my need for more input. If you like fish, you should make time to visit Los Abrigos, it’s a lovely fishing village with some of the best fish restaurants on the island. First stop was the ironically named Playa Grande, a pocket sized beach just to the west of the harbour. Even on a Saturday afternoon, there wereÂ barely a handful of bathers, I have been in the week and had the beach and the tiny bay all to myself. and that’s before I have taken my socks off. It’s a real untouched gem, but what’s that coming over the hill, it’s a monster – development, to the west, it’s sad to see the cranes and buildings marching ever nearer. Retracing my steps, and down into the harbour front, it was strangely quiet, as so much of the island is now. The restaurants slope down to the small harbour, where boats bob in the water as children sit on the quay dangling their feet over the edge and now and then plunge in for refreshment. Following the walkway up and around to the east, there’s a uncorrupted view across to MontaÃ±a Roja (red mountain) beyond the airport. This is a nature reserve featuring many rare species of birds, but it is possible to follow a path all the way to the peak, another trek on my things to do list. It’s at times like this that I wish I could paint, the swirling folds of the rock are amazing, and highlighted against the white capped blue sea, it would inspire any artist. On balance, I think breathing the sea airÂ carries much more sway with me than tapping away on a computer game. Not a silly hat in sight, just some great live music at the other Aguaviva concert in Plaza del Conquistador last night. 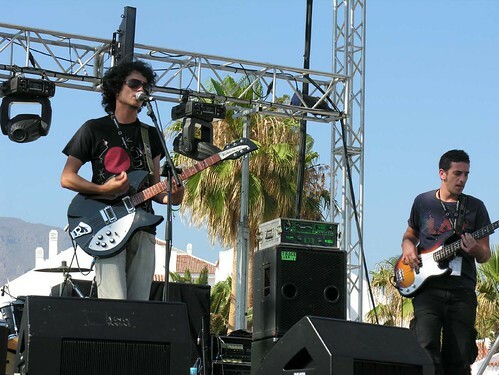 On a scorching evening Lanzarote band Oscartienealas (below) started things off in front of a sparse audience, well Spain were still playing in Euro 2008. 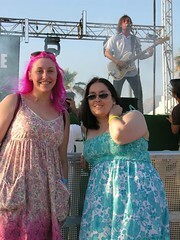 People started to gather as the excellent 3 piece band leapt around and belted out some rocking tunes. After a lengthy gap, Fiction Plane hit the stage and launched into a selection of tracks from their recent “Left Side Of The Brain” LP. 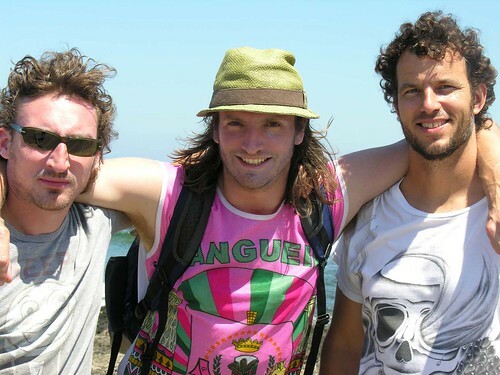 In the pre Aguaviva publicity, no one seemed to pick up on the fact that Joe Sumner, son of Sting, is the bands lead singer, armed with that knowledge, I had arranged an interview earlier in the day and met Joe (centre) , American drummer Pete Wilhoit (right) and guitarist Seton Daunt (left). Just flown in from a pre Le Mans show in France, the trio were looking forward to enjoying a few days relaxing in Tenerife, with a bit of surfing and sun. Fiction Plane pride themselves on their live performances, and racked up 200 gigs last year, including supporting The Police on their American tour and The Feeling on their UK tour, after a decent rest, they are off again later this year, this time to North America, supporting Snoop Dog. I had to ask about the group name, it has been widely pointed out that it is an angaram of Infant Police, but Pete scotched that idea as just another bizarre and unintentional link to The Police, 3 piece band with 2 Brits and an American drummer, a lead singer who plays bass, sings and writes lyrics, are just a few other similarities. Fiction Plane have built up a strong following in France, Holland and Belguim and have 2 sets of fanatical followers, The Harem and The Fictionaires, I met Fictionaires Shan (blue) and Jo Jo (pink) who had flown over from the UK especially for the concert. Both looked lovely in their colour co-ordinated outfits but I couldn’t coax Jo Jo to reveal if there was more to her match than the hair and nails. Back to the concert, and Joe’s voice has striking similarities to the old mans, but although the bands guitar sound does evoke thoughts of The Police, they have a much harder edge and their lyrics are much sharper. As the set went on, the crowd swelled, and what an interesting mix it was, dedicated music fans, passing holiday makers glowing from the beach and a sprinkling of hippies with their dogs, juggling and dancing. 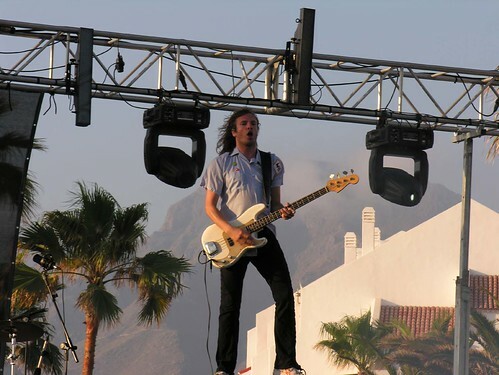 As the sun dipped behind La Gomera, the concert drew to a close after an hour and 15 minutes, and there were a lot of converts to Fiction Plane. The finale was a storming rendition of Two Sisters, one of their strongest tracks, and Joe mounted the amps for one last leap, a wild ginger haired mountain of a roadie joined in dancing across the stage and lifting his kilt to reveal the only bum note of the evening. Definately one of the highlights of this years Aguaviva. Dear Jim, I want to be an aircraft pilot. Long, long ago, when dinosaurs roamed the earth, before electronic games like Nintendo and XBox were invented, there was a kids game called Flightdeck. The aim was to land a plane on a small aircraft carrier deck using aÂ joystick. Things have moved on a pace and most kids now have access to amazingly realistic games, but if you want to go one better, how about using real flight training simulators. Granadilla has an annual event, where you can try out some of these hi tech machines within sound of Reins Sofia airport. Next Saturday and Sunday June 21 and 22 from 10 am at the Casa Cultural in San Isidro, it’s your turn to play at being a pilot. This is the fourth annual event, if you go to the website www.migranadilla.com you can see You Tube footage of previous events. Apparently to add to the realistic feeling of being at an airport, they take your bags off you as you arrive and then lose them, and they sell you a dribble of coca cola for 4 euros. I shall pop along and see what it’s like, not being into computer games, I’m sure I will manage to either crash the planes or black out the entire south of Tenerife for a few days. Hmm I wonder if they will have cyber stewardess’s doing other simulations – smiling and serving tea is what I was thinking of course. Rejoice, Rejoice, CD Tenerife are safe. They like to make us suffer, but thanks to a strong first half display, CD Tenerife beat Nastic 2-1 at home to make sure they can’t be relegated from the Segunda division. A few months ago, the talk was of promotion but 9 games without a win saw Tenerife slip worryingly near to the trap door, such are the ups and downs of being a football fan. Coach Oltra made a few changes bringing local boys, HectorÂ and Rosquette back into the squad, with Hector starting in defence.Â Just 5 minutes into the game, and from a Longas corner a Nino shot squirmed under the goalie and Culebras got a foot to it to push it in for a goal. The home lead didn’t last long and a defensive slip after 10 minutes let Calle in to level the scores. Tenerife played some good football and created plenty of chances, Oscar Perez and Longas both went close. The one player that has been outstanding all season is forward Nino, and when a Hector cros came to him just out side the goal area, he brought it down well and lashed it into the Nastic goal for his 18th of the season. Â The second half was pretty awful as Tenerife sat back and let Nastic take control of the game. Jandro forced a great save from Navas in the home goal and Sanchez hit the post as Tenerife rode their luck. Somehow Tenerife manged to keep the visitors at bay and there was a huge sense of relief at the final whistle with Tenerife finally safe from the dreaded drop. Â It was a low key (6,900 crowd) end to a home seasonÂ that after the early promise faded away and left us fearing the worst. At least now the chaps from the Armada Sur going to the final game at Malaga next week, can relax and enjoy their beer. Our despair has been all the worse for seeing Las Palmas rise up the table into the top 6, if only we had won away to the Pios, but they added on extra time until they got their equaliser. 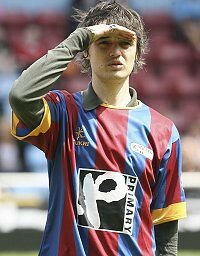 In the meantime, planning is already underway for next season, and I can reveal that the first big signing is a Brit. Peter (see pic) is a lively front man, always on the sniff, and he is always willing to work his way down the white lines.Â There is just a small transfer fee involved, payable to the Central London magistrates court. If I close my eyes, I can still see Hot Gossip dancing to Supernature by Cerone, not a confession, just tenous link number 457, to get me onto the subject of nature’s bounty here in Tenerife. 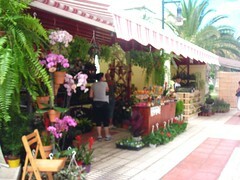 Today I popped over to the lovely fishing village of Las Galletas, and after frightening the fish I went to see the opening of the 3 day Plant and Flower Fair. This annual show takes place in Las Ramblas (straight on past the beach) and features stalls of local flora as well as honey, mojo sauces, cactus etc. It’s well worth a look, even if you are not tempted to buy, during the weeekend, 10am until about 8pm, there will be various music and dance offerings on the stage, and the judging of a local photo competition. Whizzing back to Los Cristianos, I caught the opening of the evenings Wine Fair, just before the dock area. All the exhibitors were bodegas (vineyards) from Tenerife, only 5 are listed in the official programme but I counted 8 stalls. 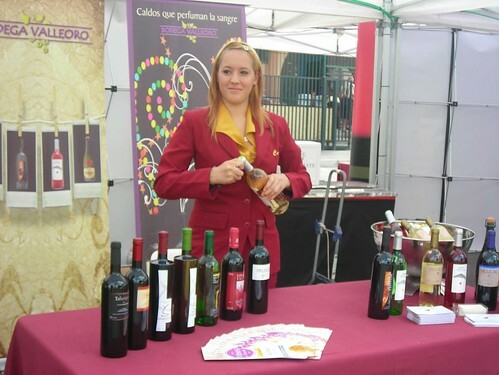 Despite the arid soil, Tenerife has a history of producing some fine wines, Guimar, La Orotava and Abona, were among the areas showing off their produce. I was of course hoping to do some sampling, and had specifically taken along my pint glass, but they weren’t making free with the vino. I believe the idea later, was to buy a ticket for a nominal fee, to sample wines, and then that price would be knocked off any purchase. By the way, the young lady in the photo isn’t miserable, she’s just popping one off – a cork that is. If you are into your wine, many of the islands bodegas do tours, followed by sampling, just check your local tourist information or cultural centre. Well, as this seems to be turning into a weekends “What’s On” I might as well cover a couple of other things. On Sunday, there is a big cycle ride starting from Guia de Isora at 9 am and ending back there at about 1.30 pm, after going through Chio, Tamimo, Santiago del Teide, Arquayo (high point 1,250 m) , Tejina, ArmeÃ±ime, Alcala, and Playa San Juan, that’s a total of 71 kms. It’s organised by the Chineje Cycle Club, click on the name for more details. And Sunday is a sad and worrying day for me, the last home game of CD Tenerife’s football season. With promotion chasing Malaga away in next weeks finale, we still need a point to make sure we can’t get relegated, so there will be plenty of singing juice imbibed before the 5pm kick off. Vamos Tenerife. My feet were barely settled on Tenerife soil again when they started to itch, so I headed up north to catch up on a few of my old favourites. 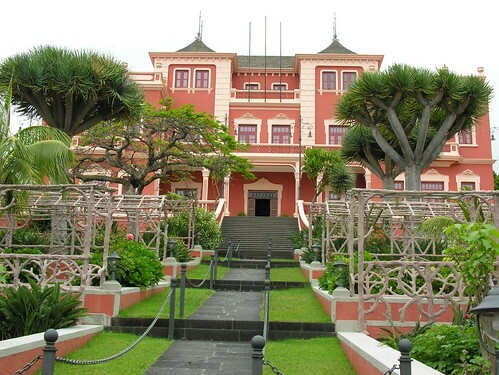 First call was Puerto de la Cruz, and very resplendent it looked with the flowers and blossom in full bloom and even as I wandered around, the council workers were busy working on the borders and flower beds. It was interesting to see lots of groups of tourists, maybe the southern resorts should go and kidnap a few. The Muelle Pesquero (fishermans port) always draws me in, it seems to sum up all that’s good about Puerto, the small shingle beach is shared by fishing boats and bathers, and all just a few yards from the busy shopping streets. 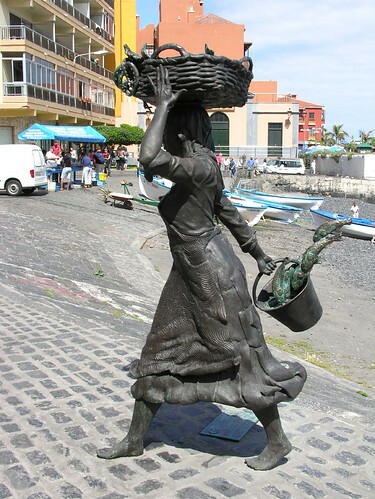 Since my last visit, a new statue of a fisherwoman has been added, sculpted by Julio Neieto, it makes a nice counterpoint to the area. Mind you I had to pick my angle carefully when taking the photo, as a rather large Canarian gentleman had emerged from the sea and was dressing very publically on the beach, a full moon might have distracted from the artisitc quality of the statue. A 15 minute bus ride took me up to La Orotava to interview Dr Leslie Brown, an Australian cycle enthusiast with his own bike hire business www.tenerife-training.net . The flying doctor was keen to pedal the environmental advantages of cycling and you can read the full piece on www.canarygreen.net . This is one of many websites I write for, and it’s a good source for news and interviews related to green issues across the Canary Islands. The Aguaviva festival runs through June, so there will be a lot of news updates from the events and interviews with some of the leading players. Anyway back in La Orotava, we went into the town to find a good spot to take pics, and I realised that although I have made brief visits there for football and changing buses, I haven’t had a good look around, something I intend to put right very soon. At the Plaza de la Constitution, my eye was well and truly caught by the very impressive Liceo de Tauro, an old family home taken into trust and used for art and exhibitions among other things. It also features a restaurant and despite the elegance of the place, the menu looked very reasonable. I thought of buying the house as a little country home but the gardens looked like far too much hard work. Tracing my way back via Puerto de la Cruz, I had time to pop into Santa Cruz just to see if all was well. I have been anxiuosly watching the re-development of the Plaza de EspaÃ±a, the latest re-opening date is June 30, but it still looks quite a way from being finished. Back to Los Cristianos, and armed with maps and leaflets from La Orotava, a future expedition is already taking shape in my mind. Well I returned to Tenerife the way I flew in, via Manchester, and I must say I was impressed with the city. It must be around 15 years since I last went there to watch Manchester Storm play ice hockey at the MEN arena. 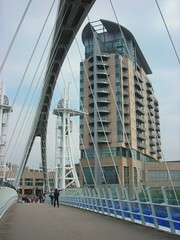 A lot of money and effort has been put into the city and it shows, from Salford Keys (pic) to the city centre with its own millenium wheel. The big Premier Inn building had Peregrine Falcons nesting high up, and a camera trained on the nest showed pics on a large city centre screen – with not a word from Bill Oddie. One warning though if you are flying out of Manchester Terminal One, it’sÂ under redevelopment and has little in the way of services. My flight was midnight, and the few shops after check in, were closed, as well as the American muffin cafe, and worst of all NO BAR, that’s unheard of, even Camberwick Green airport would have a bar. 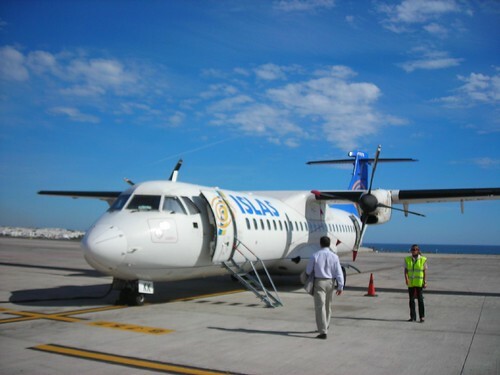 It was bad for familes with children, and passengers for a Malaga flight had suffered a 3 hour delay. Of course the large duty free shop was open and you are channeled through it on the way to the boarding gates. My flight was with Futura Airways, who have the less then reassuring shortened title of FU Airways. Once on board it was ok, although the stewardess’s wear black leather gloves as part of their uniform, maybe they make specialist movies as a sideline. 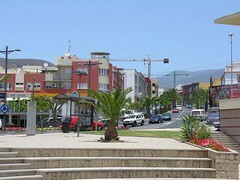 Anyway, back in Tenerife at 4am on Saturday morning, and a taxi soon had me home, at 21 euros thats pretty reasonable. Now it’s catch up time, this looks like a busy month, Aguaviva has started some of its events as it builds up to the big music concerts. I’ve only scratched the surface of the papers and news sites from the last few days, but already there is a lot to look forward to and the small matter of the last 2 games for CD Tenerife. They drew 2-2 at Celta Vigo on Saturday, that’s 9 games without a win, and still a point needed to make sure they can’t be relegated. I’m raring to go, come on June, lets be having you.